Photo by Larry Underhill, with permission from the P.B. DeRosa family. The ancient Polynesians played a game very similar to modern-day bowling. Perhaps the architect and Long Beach resident P.B. DeRosa made note of that when he designed Java Lanes, the iconic bowling alley on Pacific Coast Highway that opened in 1958 and continued beckoning visitors into the 21st Century with its space-age neon sign and gigantic, sweeping A-frame entryway. Java Lanes was part of a wave of wild-looking Polynesian-themed bowling centers that popped up in the late ’50s in cities and suburbs across the country. They were an extension of the Pacific Island-influenced “Tiki” culture that began in L.A. and San Francisco in the ’30s, gained momentum after World War II, and, by the ’50s, had swept the nation. Java Lanes was the quintessential baby-boom recreation spot, and a constant flow of guests enjoyed the South Pacific-meets-Jet Age amenities of its coffee shop, dining room, banquet room, cocktail lounge, ballroom, billiard room, supervised nursery for the kiddies and thirty-two bowling lanes, with a top-notch pro shop. “These bowling alleys were ultra-lavish transportation to an exotic world,” says Chris Nichols, Associate Editor at Los Angeles Magazine and curator of “Bowlarama! California Bowling Architecture 1954 – 1964,” an exhibition currently running at the Architecture and Design Museum in L.A. The exhibition includes information and history from the career of architect DeRosa, a real Renaissance man who spared no creative whim when designing Java Lanes, which simultaneously incorporated earthy materials (like flagstone, lava rock and wood tiki sculpture) and elements of the futuristic “Googie” architectural style that was also flourishing in L.A. in the ’50s. P.B. DeRosa and his older brother were raised by their widowed mother in Brooklyn, New York. Pasquale (who later went by “P.B.” or “Pat”) was a gifted young man who went on to get his degree in architecture from the prestigious Pratt Institute in New York City. After a stint in the Army he decided to move his family to the West Coast, and he got his architecture license in Long Beach, where, in 1955, he was taken on as a partner by Gordon Powers and A. W. Daly. Soon, the firm of Powers, Daly and DeRosa became the darling of the bowling alley industry, despite some criticism from the architectural establishment. Derided as “frivolous” and “fanciful,” DeRosa’s building designs were immensely popular nonetheless. 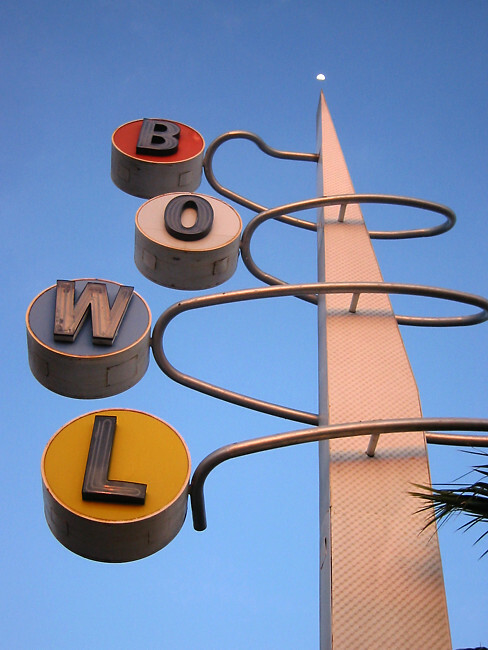 During the late ’50s and early ’60s, Powers, Daly and DeRosa built over 50 bowling alleys in California. At one point, Walt Disney, who headed an investment group that included Jack Benny and Bing Crosby, contacted DeRosa about designing a massive bowling center outside of Denver. “Going to Java Lanes was like stepping into an island paradise,” says Nina DeRosa-Tay, P.B. DeRosa’s daughter and Long Beach Poly graduate who spent many hours hanging out at Java Lanes with her classmates, often while her dad was also there (he was an avid bowler who competed in the thriving Java Lanes bowling league). Nina remembers her father as a terrific cook (he’d developed his culinary chops in the Army) and as a talented jazz vibist and accordionist who unwound from the pressures of the architecture business by playing gigs on Catalina and at the Officers Club at the Long Beach Naval Station. P.B. DeRosa, who also designed the Golden Sails Hotel in Long Beach, didn’t discuss his business much with his family, but Nina, who inherited her father’s gifts for drawing and music, learned volumes from observing her father’s creative processes. “My father loved kites, and was very much influenced by their shape,” says Nina. A close look at the cantilevered roof of Java Lanes will confirm this. P.B. DeRosa, with his daring and unorthodox approach, created a national architectural trend, and Java Lanes was a perfect example of it. Over the years, business at Java Lanes cooled somewhat, but enjoyed a revitalization in the ’90s when one of its space-tropical entertainment rooms became the Lava Lounge. Mark DiPiazza reactivated Java Lanes’ long-dormant entertainment license and put together years of high-energy music shows in the Lava Lounge, nurturing tons of local bands and playing host to touring acts like Weezer, Rocket From The Crypt and Lit, who filmed the video for their hit “My Own Worst Enemy” at Java Lanes (see video below). Unfortunately, this new burst of energy at Java Lanes would sometimes spill into the surrounding neighborhood, and complaints and police calls began to pile up. In 2002, the bowling alley had its entertainment license revoked. In 2004, facing slow business and with offers on the table, the Java Lanes owners sold their property, and that summer the mid-century bowling alley masterpiece was demolished to make way for a townhouse complex. Its beautiful roadside “BOWL” sign was last seen being dismantled and loaded into a semi-truck. Internet comments on various tiki and nostalgia sites from 2004 reveal a deep sadness about the passing of Java Lanes, which hosted countless brides and grooms, bowling aces of all ages, lounge lizards, late-night diners, decades of New Years revelers, and the youth culture of a few generations. In the eyes of urban archeologists like Chris Nichols and in the minds of the thousands upon thousands who visited it during its 46-year run, Java Lanes is a legend.